(Kenta and Keita come in swinging on vines to greet their father, Inuyasha, and their uncles, Ginta and Kiibo.) Kenta and Keita: Hey, dad! Hey, Uncle Ginta and Uncle Kiibo. Inuyasha: Ah, my favorite sons of all time, hello. Ginta: Kenta, Keita, it’s so good to see you. Kiibo: Well, if it isn’t my most favorite nephews, Kenta and Keita. (Inuyasha, Ginta, Kiibo, Kenta, and Keita come running towards each other and give each other a five-way body slam.) Inuyasha, Ginta, Kiibo, Kenta, and Keita: RAAAAHH!!! (The five then give each other a massive bear hug.) Inuyasha: So, Kenta, Keita, how have you been? Kenta: Oh, you know, the usual. Keita: Hunting, scouting the jungle, and training. Ginta: Well, that’s great to hear. Kiibo: You two seem to be getting stronger every time we see you. Kenta: Speaking of strong. Keita: Dad, Uncle Ginta, Uncle Kiibo, could you please show us your muscles? (Inuyasha, Ginta, and Kiibo look at each other and smile. They look at Kenta and Keita.) Inuyasha, Ginta, and Kiibo: All right. Inuyasha: Then you’ll have to make poses with us. Ginta and Kiibo: Agreed? Kenta and Keita: Agreed. (Inuyasha, Ginta, and Kiibo raise their arms and flex their biceps complete with a mighty lion’s roar.) Inuyasha, Ginta, and Kiibo: ROOOOAAAR!!!! (The three men then show their muscular backs to Kenta and Keita. After that, Inuyasha, Ginta, and Kiibo turn around and show their pecs and deltoids.) Inuyasha: You boys like what you see? (Kenta then touches Inuyasha’s right bicep, who raises his arm to flex it. Meanwhile, Keita touches Ginta’s left bicep and Kiibo’s right bicep, thus comparing the two.) Inuyasha: That’s right, Kenta. If you and Keita keep training with me and your uncles, you will be as strong as I am. (Inuyasha raises his left bicep with a low growl.) Ginta: Or even me. (Ginta flexes his deltoids with a snarl.) Kiibo: Or even me because I’m stronger than both your dad and uncle! (Kiibo flexes both of his tremendous biceps with a roar.) Inuyasha: So, you boys think you got what it takes to take us down in a posedown? Ginta: We’d like to see you try. Kiibo: Let’s see how powerful you two really are. Kenta: Dad, uncles, we got one thing to say to you. Keita: And you know what it is. Kenta and Keita: It’s on! 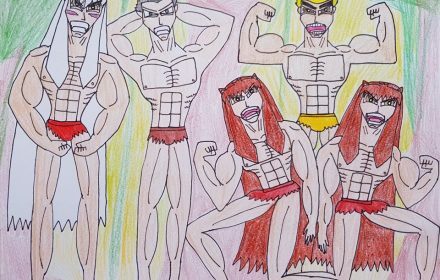 (Inuyasha, Ginta, Kiibo, Kenta, and Keita get to their positions and start flexing their muscles. They flex their biceps, pecs, deltoids, and back muscles.) Inuyasha: Well, I must say. We’re impressed with you two. Kenta and Keita: Gee. Thanks, dad. Ginta: And now. Kiibo: The grand finale. 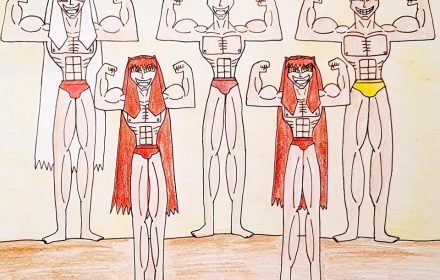 (Inuyasha, Ginta, Kiibo, Kenta, and Keita huddle and flex their deltoids and let out a growl.) Inuyasha: Kenta, Keita- Ginta: Now you have to shoulder check the three of us. Kiibo: Come on! Kenta and Keita: All right! (Kenta and Keita give a forceful shoulder check to Inuyasha, Ginta, and Kiibo, who end up tumbling down on top of each other. After that, Kenta and Keita extend their hands to their father and uncles. Inuyasha, Ginta, and Kiibo pull Kenta and Keita and play wrestle with each other while laughing.) Kenta and Keita: So, dad, uncles, what do you think? Inuyasha: Well, we have this to say. (Inuyasha, Ginta, and Kiibo pull Kenta and Keita to a group hug.) Ginta: We’re really proud of you. Kiibo: You proved yourselves to be really strong warriors. Kenta: Hey, dad, Uncle Ginta, Uncle Kiibo. Inuyasha, Ginta, and Kiibo: Yeah? Kenta: We’re all best pals, right? Inuyasha: Right. Ginta: Absolutely. Kiibo: No doubt about it. Keita: And we’ll always be together. Inuyasha, Ginta, and Kiibo: For sure. Kenta and Keita: And we’re all gonna be strong together, right? (Kenta and Keita flex their biceps.) Inuyasha, Ginta, and Kiibo: Yes, we are. (Inuyasha, Ginta, and Kiibo flex back.) Inuyasha: Plus, we’re all gonna protect this jungle. (Inuyasha, Ginta, Kiibo, Kenta, and Keita proceed to stand up.) Inuyasha: If any poacher or enemy dares to come barge into this jungle, he will have to face me! (Inuyasha flexes his deltoids and biceps and lets out a growl.) Ginta: And me! (Ginta puts his hands behind his nape thus flexing his biceps and pecs and lets out a growl.) Kiibo: And me! (Kiibo raises his arms, flexes his biceps, and lets out a mighty lion’s roar.) Kenta and Keita: And us! (Kenta and Keita put one knee down and flex their bicep.) Inuyasha: Let’s spread the word. Ginta: This jungle is our home. Kiibo: And we will protect it. Kenta: So, invaders, marauders, pillagers, and poachers. Keita: Beware. Inuyasha, Ginta, Kiibo, Kenta, and Keita: ROOOOAAAAARRRR!!!! There’s absolutely no screwing around with these jungle protectors that’s for sure. Boy, I did enjoy putting Inuyasha, Ginta, and Kiibo be the Tarzans to Kenta’s and Keita’s Koraks. And let’s face it, I certainly love it when Inuyasha, Ginta, Kiibo, Kenta, and Keita have moments of badass male bonding. Well, I hope you all enjoy this post and this picture. Until next time. Inuyasha and Ginta from Inuyasha belong to Rumiko Takahashi and Sunrise. Kiichi “Kiibo” Miyazawa from Shootfighter Tekken or High School Exciting Story: Tough belongs to Tetsuya Saruwatari and Anime International Company. Kenta and Keita belong to me. 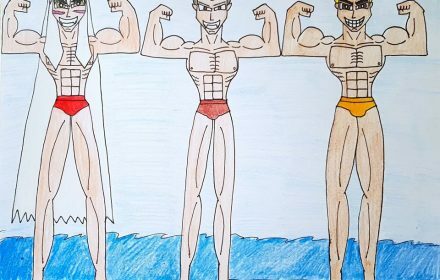 This summer we have at our presence three big, buff hunks of the beach, Inuyasha, Ginta, and Kiibo, to greet the summer the only way they know how. Inuyasha: Yo, Ginta, Kiibo, you guys ready? Ginta: Definitely! Kiibo: Yeah, big bro! (Inuyasha, Ginta, and Kiibo stand in a line, raise their strong and powerful arms, and flex their biceps.) Inuyasha, Ginta, and Kiibo: Grrrr….RAAAAH!!!! Inuyasha: Here we are in Okinawa Island. I’m Inuyasha. Ginta: I’m Ginta. Kiibo: And I’m Kiibo wishing you all an awesome summer! Inuyasha, Ginta, and Kiibo: WOOHOO!!!! Inuyasha and Ginta from Inuyasha belong to Rumiko Takahashi and Sunrise. Kiichi “Kiibo” Miyazawa from Shootfighter Tekken or High School Exciting Story: Tough belongs to Tetsuya Saruwatari and Anime International Company.